Understanding how protein machinery of a biological cell packages, copies, and transcribes the encyclopedic information encoded in the genome requires the capability of applying forces like those in nature in a laboratory dish.Although optical traps, magnetic beads and an atomic force microscope can be used to apply forces to individual biomolecules, these tools employ tethers to transmit force from micron-size objects to the biomolecules of interest and generally have low throughput. The laboratories of Gregory Timp (ECE) and Aleksei Aksimentiev (Physics) at the University of Illinois, Urbana-Champaign have recently demonstrated a new tool for single molecule manipulation that obviates the use of tethers and offers high throughput (http://dx.doi.org/doi:10.1093/nar/gkp317). In this method the gradient of the electrostatic potential is used to capture single DNA molecules and associated proteins in a solid-state nanopore. Once DNA is loaded into a nanopore, the electrostatic field is used to rupture the DNA-protein complex. 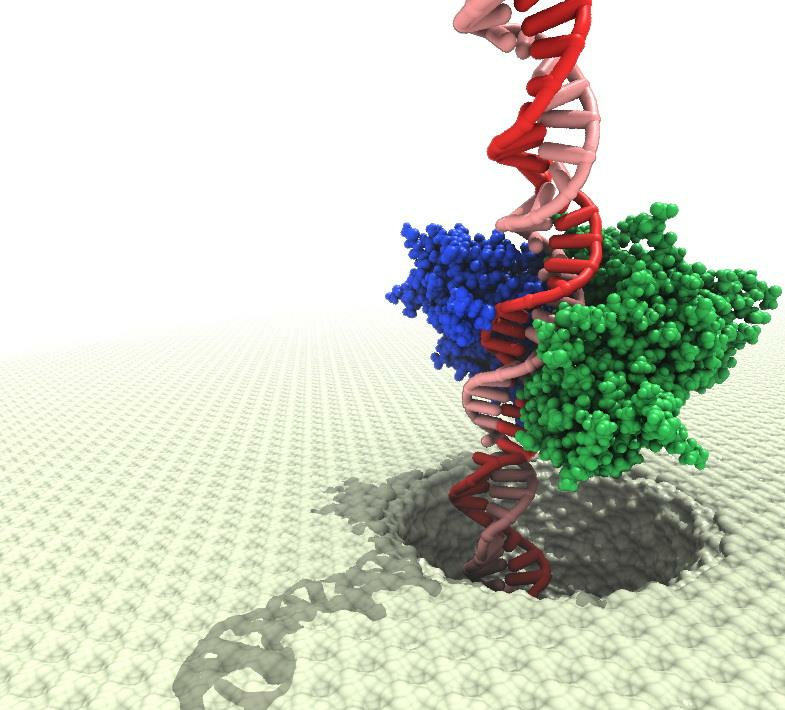 Using a nanopore as electrostatic tweezers, the researchers have analyzed the forces binding a protein to a specific nucleotide sequence of a DNA molecule. Molecular dynamics simulations validated the electrostatic tweezers mechanism and provided accurate estimates of the forces involved.